Project Tomorrow and Blackboard Inc. released Learning in the 21st Century: 2009 Trends Update at NECC on Tuesday, Jun 30th, 2009. This new report serves as an update to Learning in the 21st Century: A National Report of Online Learning and its companion report 2008 Trends Update which can both be downloaded from the Blackboard website. 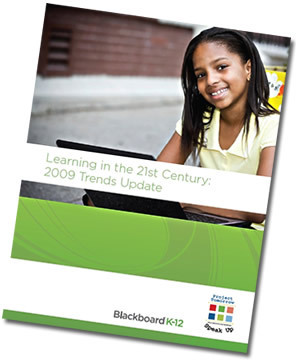 Learning in the 21st Century: 2009 Trends Update, examines the growing student interest for online learning and how schools are meeting that demand. This report, which is the third in a series of reports published by Project Tomorrow®, a national education nonprofit organization, in collaboration with Blackboard Inc., examines the Speak Up 2008 survey data collected online in Fall 2008 from more than 335,000 K-12 students, teachers, administrators and parents from across the nation. Click here to download the report. This report highlights how students are utilizing technology to become "free agent learners" and driving the demand for more online classes in and out of school. Yet, our schools are limiting online classes to remediation and credit recovery for students, and primarily focusing their online learning initiatives towards professional development for teachers. Through this report you will gain insight, from schools and districts across the nation, about why students and teachers want access to classes online, the current challenges faced by districts with online learning implementations, and how online learning presents unprecedented opportunities for meeting the needs of our 21st century learner. Sign up for Project Tomorrow News to receive updates about the Speak Up National Research Project!